Distance learning has gone from novel to normal. Students are enrolling online in record numbers, and in a broad range of programs. Many students enrolled in traditional campus settings are also taking online or hybrid courses. These programs create demands for thinking about teaching, learning and the economics of higher education in new ways. Inside Higher Ed editor Scott Jaschik and reporter Carl Straumsheim discuss the new generation of distance learning programs in this free webinar. 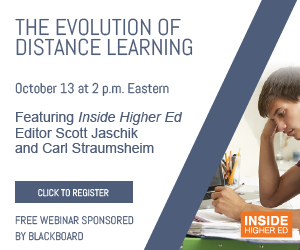 Before viewing the webinar, we invite you to download our free booklet, The Evolution of Distance Learning, a compilation of articles from Inside Higher Ed, at www.insidehighered.com/booklets . You can download the accompanying slide deck here . Inside Higher Ed's Distance Learning webinar is made possible with the support of Blackboard.